Discovered 1775 by Johann Elert Bode. Globular star cluster Messier 53 (M53, NGC 5024) is one of the more outlying globulars, being about 60,000 light years away from the Galactic center, and almost the same distance (about 58,000 light years) from out Solar system. At this distance, its apparent angular diameter of 13′ corresponds to a linear diameter of roughly 220 light years. It is rapidly approaching us at a velocity given by Mallas as 112 km/s, by Harris as 79 km/s. M53 has a bright compact central nucleus of about 2′ in diameter, although its stars are not very concentrated toward the center when compared to other globulars, and a gradually decreasing density profile to the outer edges. Harlow Shapley classified it in density, or concentration class V. While the NGC, following John Herschel, suspected its brightest red giant stars at about 12th magnitude, the Deep Sky Field Guide lists them at 13.8 mag, and the horizontal branch at about magnitude 16.9. The cluster’s overall spectral type is givan as F6. Its discoverer Johann Elert Bode, who found it on February 3, 1775, described it as a “rather vivid and round” nebula. Charles Messier, who independently rediscovered and cataloged it two years later, on February 26, 1777, found it “round and conspicuous” and that it resembles M79. William Herschel was the first to resolve it into stars, and found it similar to M10. As in all globular clusters, the stars of M53 are apparently “metal-poor”, which means that they contain only little quantities of elements heavier than helium (actually mainly elements like carbon and oxygen); those of M53 are even below the average globular cluster members in “metallicity”. It contains the considerably respectable number of 47 known RR Lyrae variables, some of them were reported to have changed their periods irreversibly with time (Kenneth Glyn-Jones). In small amateur telescopes, M53 appears as a slightly oval nebulous object with a large, bright center, of rather even surface brightness and evenly fading out to the edges. Mallas reports that he saw many stars in the 4-inch refractor under excellent viewing conditions, with the central part appearing somewhat grainy. In somewhat larger telescopes, its outer fringes appear resolved into stars, while the central part is still unresolved and grainy, with one star standing out, in telescopes of about 8-inch aperture. Large instruments of about 12-inch up show it well resolved, with a moderately concenterated nucleus and stars spread out to about 12 arc minutes diameter. M53 can be easily found just 1 deg NE of the 4th-mag star, 42 Alpha Comae Berenices, a visual binary star (A: 5.05, B: 5.08, both of spectral type F5V). Alpha Comae itself may be located by either following the line from Arcturus via Eta Bootis by a further 11 deg to the W, or by following the line of Gamma – Delta – Epsilon Virginis by another 7 deg NNE. 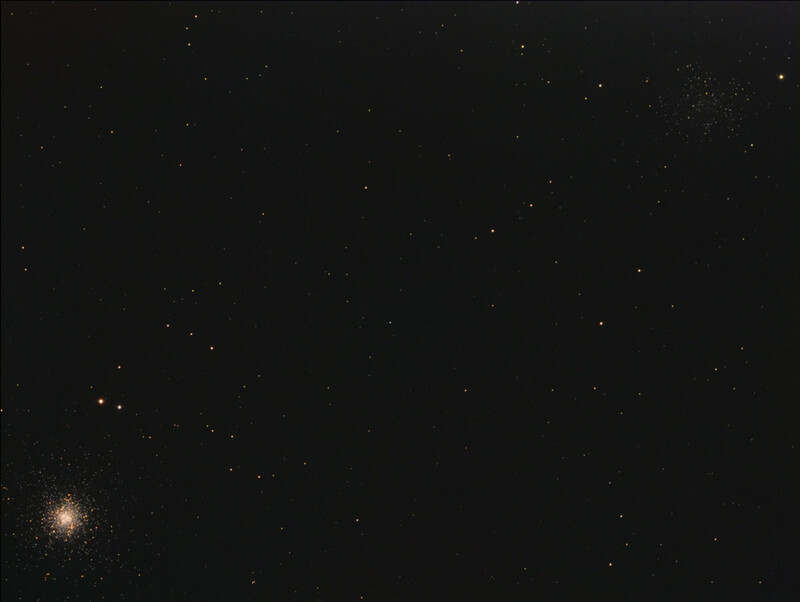 At only about 1 degree separation to the east, the faint and quite loose globular cluster NGC 5053 comes into the field of view, which is at roughly the same distance as M53 (53,500 light years), indicating that these clusters are also physically rather close together. NGC 5053 was discovered by William Herschel on March 14, 1784 and cataloged as H VI.7. NGC 5053 is of a much lesser stellar density than its prominent neighbor, and particularly lacks a concentrated bright nucleus. At a distance of about 53,500 light-years from us, NGC 5053’s apparent diameter of 10.5 arc minutes corresponds to a linear extension of about 160 light-years. The cluster shines at a visual brightness of about 9.5 magnitudes, and a photographic magnitude 10.5. Its absolute visual magnitude is only about -6.72, corresponding to an intrinsic luminosity of about 40,000 times that of our sun. It is receding from us at about 44 km/s. Because of its moderate stellar content, the nature of this cluster as a globular has been doubted in the past, but spectroscopic investigations have now firmly re-established this classification: The stars of NGC 5053 are old and poor in heavy elements. Its horizontal-branch stars are of about mag 16.65, and its brightest stars are at mag 13.8. It was found that this cluster may perhaps be a former member of the Sagittarius Dwarf Elliptical Galaxy (SagDEG), or Sagittarius Dwarf Spheroidal Galaxy (Sgr dSph), the nearby dwarf galaxy discovered in 1994, which is currently in a close and perhaps final encounter before its tidal disruption, with our Milky Way Galaxy.